Starting in 1977, the Department of Ecology v. Acquavella adjudication is the longest-running general adjudication in state history, determining the validity and establishing priority of surface water claims in the Yakima Basin. With the issuance of the Final Decree by Yakima County Superior Court, water right holders in the Yakima Basin will finally have certainty over the authorized quantities and purposes and places of use of their water right claims. Adjudicated water right certificates will be issued by Ecology for all claims determined by the Court to be valid; water right holders will no longer need to get approval of the Court to complete a change or transfer a water right, but instead file applications with Ecology like everywhere else in the State. During the adjudication, stakeholders in the Yakima Basin continued to lead the state in providing innovative approaches to water resource management challenges, including early adoption of water banking and mitigation markets to ease permitting of new water rights, and development and implementation of the Yakima Basin Integrated Plan. Aspect has worked on a variety of Aquavella claims over the decades – including hundreds of due diligence water right evaluations; helping buyers/sellers move and change these rights; and developing water banks through the State’s Trust Water Right Program to support efficient transfer of existing rights and permitting of new, mitigated water rights. Read the fascinating tale of water management in the Yakima River Basin and the implications of this ruling in this great Department of Ecology blog post. See what else Aspect’s Water Resources practice has been up to. Aspect’s water law expert, Dan Haller, will be presenting on Water Banking for Agricultural Water Supplies at the 27th Annual Water Law in Washington conference (June 14-15). This year’s conference focuses on major legislative changes, new case law, and important practical information for water rights and resource management in the State of Washington. Water banking is increasingly being looked at as an innovative approach to storing and releasing water in water-challenged areas of the West. 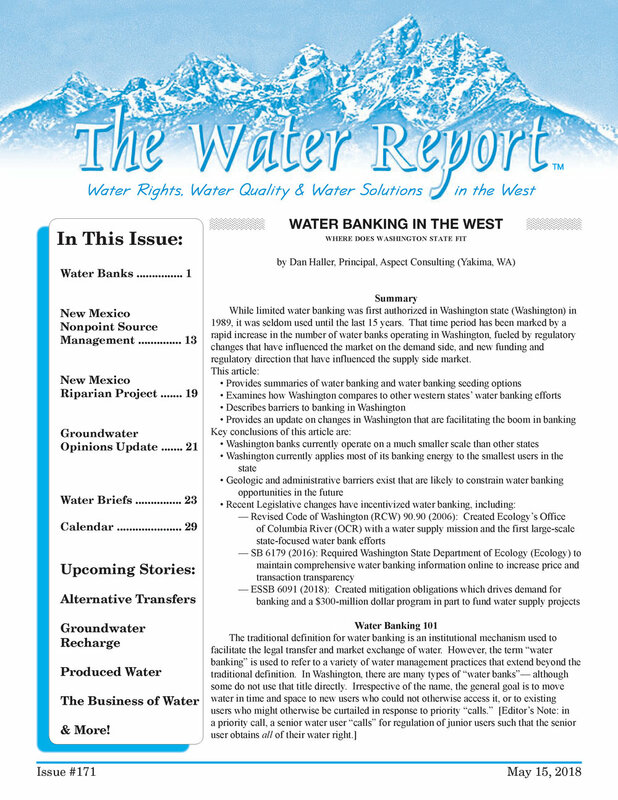 In May’s issue of The Water Report, Aspect’s Dan Haller wrote an in-depth look at water banking in Washington state, how it compares to the rest of the West, and what recent legislative changes mean for the successful adoption of this water supply tool. Click below to read the article. On day two of this year’s WPUDA conference in Leavenworth, Aspect’s Dan Haller will be participating on a morning session panel titled “What’s a Water Bank and How Does it Work?” During the afternoon sessions, Dan will be giving a Water Rights 101 presentation. Public Utility District's manage numerous water rights over domestic systems, dams, hatcheries, and Parks, which put them in a unique position to participating water Banks to accomplish their overall District. Protecting District water rights is a key priority to ensure they are available for multiple District business needs. Dan will be giving a presentation on the Hirst decision and how it affects Eastern Washington water rights to the Yakima County Bar Association September 29th. The Hirst decision changed the regulatory framework of County rural building permit and land use policies and is prompting numerous changes from new regulations, moratoriums on building, creation of water Banks, and water write transactions. Aspect's Dan Haller will be presenting on the practical implentation issues of Water Banking in Washington State at Law Seminars International on Tuesday July 25 in Seattle. With water policy presently in the forefront of the state's political arena, water managers across the state are hunting for better solutions to manage water supply. Water banking is a relatively young but promising water policy approach that builds a framework, based in science, of transferring and using water across a municipality. Water banking has promise because it's better at solving one-to-many water authority issues than traditional water transfers and can be more advantageous under the water code than traditional transfer. Dan will be presenting alongside Peter H. Dykstra, with Plauche and Carr LLP and Kristina Nelson-Gross with the City of Sequim. On April 12, Aspect’s Dan Haller will co-present with Kittitas County Commissioner Paul Jewell on the future of Kittitas County Water Resource Management. Kittitas County has been at the heart of the state’s recent water banking approach with the most mature and heralded water bank in Washington. Over the past 10 years, they went from the staunchest opponent to exempt well management to the unquestioned leader in the State, with broad state, local, and tribal endorsement of their transformation. Over the years, Aspect has helped the County develop the program, including an innovative "over the counter" water rights program. The presentation will be at the Starlight Lounge in Ellensburg and hosted by the Washington Chapter of the American Water Resources Association (AWRA). Aspect Consulting partnered with Washington State University, the University of Utah, and Ecology’s Office of Columbia River to develop the 2016 Long-Term Water Supply and Demand Forecast. From climate change to crop change, from municipal growth to hydropower demand, from water banking to declining groundwater, this report tells the story of how Washington is changing in response to a myriad of physical, economic, and legal challenges facing the State. Over 2 years in the making, the report represents a comprehensive look at where Washington is going in the next 20 years and beyond. A recent Washington State Supreme Court ruling has changed how counties review permit-exempt (household) wells for building permits under the Growth Management Act. This ruling states that counties cannot approve new development using permit-exempt wells if there would be impairment to instream flows or impact to closed water bodies. The Yakima Herald-Republic looks at how the recent Supreme Court ruling affects water rights in Kittitas County. Aspect’s Dan Haller is quoted on how water banks are currently in place and can work beyond the Yakima Basin. You can read the article here.